To make shopping for your wedding dress fun, easy and painless, don't just hit the stores and wait for the dress to fall on your lap. Make a plan! Decide when to shop. There's no time too early to start looking, but there is a time that's too late. Depending on where you get your dress, it could take several months for your dress to be ordered and shipped. From then, you'll need several weeks for your seamstress to make alterations. You should start shopping about 9 months before your wedding, but preferably sooner. There's nothing wrong with beginning early, even a year before you'll actually place an order. But don't make the mistake of buying yet. The last thing you want is to buy what you think is your dream dress two summers before your wedding, and find out the following summer that your real dream dress has just been created. Decide where to shop. This will probably be a decision based on your budget. Decide whether you'll shop at chains, small boutiques, etc. Decide how far you'll travel to see dresses in person. If you want an expensive designer dress, you may have to travel to New York City to actually try it on. However, if you've chosen to include places like David's Bridal, you're sure to find one nearby. In bigger cities you'll have access to a number of shops and boutiques, which will carry gowns from a number of designers, but they'll probably be more on the expensive side. Beware of shopping online! Getting the dress sized correctly is very important, and this is best done by actually trying it on. If you're not careful you could seriously regret your decision and spend double the money if you don't like the dress you bought online and have to buy a new one. If you decide to shop online, do so with great care. Many places don't require an appointment, but you should make one anyway. This is to ensure you don't wait around for an hour while the consultant help customers who did have appointments. People with appointments will always come first. Some people claim to have had bad experiences with chain stores, such as encountering sales consultants who are unfriendly or not helpful. It's hit or miss. The good news is, those stores will always have another location somewhere nearby, and you can always go to the other one. If you get a consultant who isn't nice to you and you don't want to check out the other location, just ask for a different consultant. If you're too embarrassed to do so, just leave and report her to the manager anonymously. No sales consultant has the right to be unkind to a bride! Some shops will not let you browse freely through the gowns. They'll ask you for a description of what you're looking for and then bring you gowns they think match it. If you really hate the idea of not being able to see everything yourself, avoid these places. Call and ask first if it's important to you. Large warehouse type stores are excellent places to find gowns. They have dresses for every budget, and will usually let you browse through the gowns as long as you want and try on as many as you want. Look for a company that specializes in rental dresses. This can be a great solution for the bride on a budget. Men rent tuxedos - why not rent the dress too? Take what you need with you. Make sure another person goes along with you. You'll definitely want an opinion aside from the consultant's. 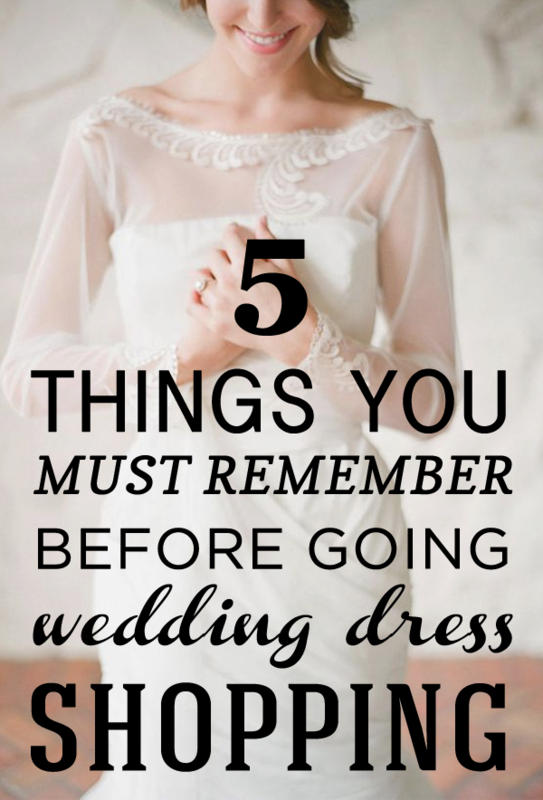 However, don't make the mistake of taking your mother, your maid of honor, your bridesmaid, your other bridesmaid, and your other bridesmaid's little sister. Not only will they get in the way, but none of them will all agree on anything, and mostly likely, at least one of them won't like whatever dress you're trying on. It's probably best to take one person (or maybe two, like your mother and maid of honor), whose opinion you trust and value. If you're allowed, take a camera (preferably digital) with you to take snapshots of the dresses you love the most so you can keep a record of them. You'll probably try on many dresses during your search, and you'll probably quickly forget the details of each dress as you try on the next one you love. Having photos helps you remember and compare them later so you can narrow down your choice. If you can't take photos, keep a list of the designer and dress number or name so you can look them up online and save the photos that way. Take along a bottle of water or something else hydrating. Trying on dresses can turn into a time-consuming experience, and it can also be a workout, so make sure you bring a beverage. Just be sure to keep it away from the dresses. Photos of dresses you found online or in magazines, if you have any. Even if they're dresses made by another designer, the shop you're in may be able to help you look for something similar. A lot of chains have styles that bear a resemblance to dresses by an expensive designer as a cheaper alternative for brides with smaller budgets. If you've already decided to wear a certain item (such as a specific pair of shoes, veil, or jewelry) because it has sentimental value, take the item along with you. If it's absolutely necessary that you wear it on your wedding day, you'll want to make sure the dress you choose goes well with it (though this may narrow your options considerably). Look at choices for length, sleeve style, necklines, waistlines, trains, etc.There are a ton of options out there! Do a little research on what's possible for certain fabrics and silhouettes, but don't rule out gowns of a specific type because they don't have all the little details you prefer. If you see what looks like the dress of your dreams but it has sleeves and you wanted a sleeveless, or if your dream gown ends up having a huge train and you wanted a shorter one, you can ask a seamstress to alter these things. However, remember that seamstresses often charge a whole lot for little things, so if you want to change TOO many things about your gown, you may be better off continue your search. Also keep in mind that most of the time, the same dress can be ordered in various colors. When you start to shop or search for gowns online, don't pass up a dress just because it's stark white and you want champagne. If you love it, check to see if it's available in champagne. Beware of salespeople. Don't let the sales consultant talk you into anything. Remember that many consultants work for commission. Sadly, many sales consultants won't care if you really do look beautiful -- they'll want you to purchase the most expensive dress, regardless of how it looks on you. Some of them will have a genuine interest in helping you find the dress of your dreams. But don't take a chance, and stick to your own opinion and that of the people you take with you. Don't be discouraged. Most women will try on many, many gowns during their search. It's not only normal to not find the perfect gown on your first try, it could be a warning sign that you're making a rash decision you'll regret later. Some women get lucky and do find their dream dress shortly after they start looking, but it's most likely something they realized later, after looking through many other dresses that didn't compare to the one they found in the beginning. No matter what, the savvy shopper will keep looking and then go back to that dress later if it really turns out to be The One. Expect to try on anywhere between 30 and 150 dresses before finding the final one. Some women try on hundreds. Don't feel bad if you shop for months and try on 600 dresses before you find the one that seems to be made for you. Shop around. Once you've found the dress you want to wear on your special day, consider shopping around for various prices before you make your final purchase. One shop may have the dress you want on sale for considerably less than another. You may be able to find your dress online (but remember to always be sure you actually see and try on the dress in person before you ever purchase online). If you don't mind wearing a gown that's already been worn by another bride, you can save a great deal of money. You'll just have to consider that it's already been altered to fit the other bride, so make sure you get a very detailed description of what's been done to the dress. Have fun! This is a time in your life when you get to try on as many exquisite and expensive dresses as you want. You'll be the center of attention (at least among your group at the shop) and people will treat you with special kindness because you're a beautiful bride. Have fun! Article provided by wikiHow, a wiki how-to manual. Please edit this article and find author credits at the original wikiHow article on How to Shop for a Wedding Dress. All content on wikiHow can be shared under a Creative Commons license.